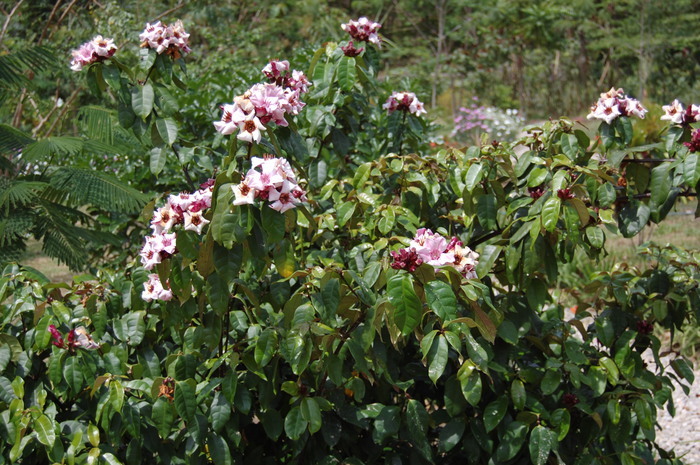 The Rose periwinkle, Holarrhena, Indian snake wood and the Climbing oleander, are members of the Apocynaceae family. This family is characterized by the contorted slips of the flower crown. The ovary consist mostly of 2 parts joined at the lower and upper side, the fruit is split in two parts. There is abundant milky juice. 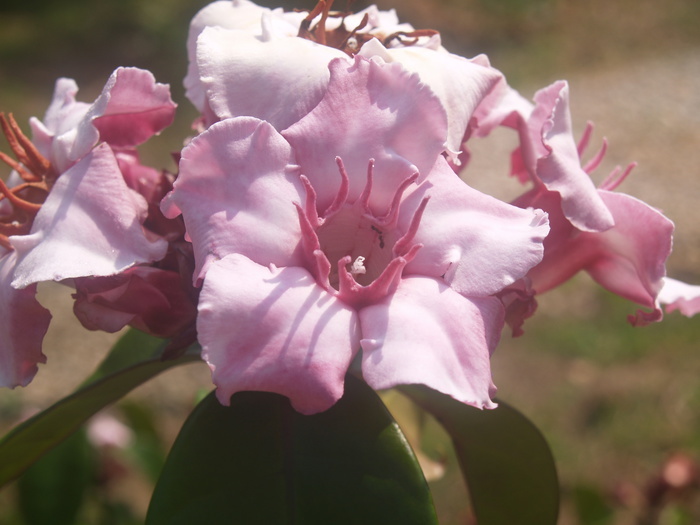 The flowers are very often showy and fragrant. The milky juice of some species can be processed to rubber and even to chewing gum. This family is also famous for the many medicinal and thus toxic plants. The medicinal substances can be divided in two major groups. One group is the cardiac-glycosides. These compounds have a digitalis like action on the heart. The heart contraction is improved and the volume of pumped blood is higher, but in over dosage the heart will stop beating. The other group are the alkaloids. These are nitrogen compounds made from the building stones of proteins, amino acids or the building stones of DNA/RNA, purines. Alkaloids have many different toxic/medicinal actions in bacteria, fungi and animals and even in other plants. Nerve cells communicate with other cells by releasing chemicals to alert the receiving cell that it should alter its activity. These substances are called neurotransmitters. An great number of neurotransmitters are variations of amino acids, just as many alkaloids. These look alikes alkaloids can disturb the communication between nerve cells in the nervous system and organs in the body. 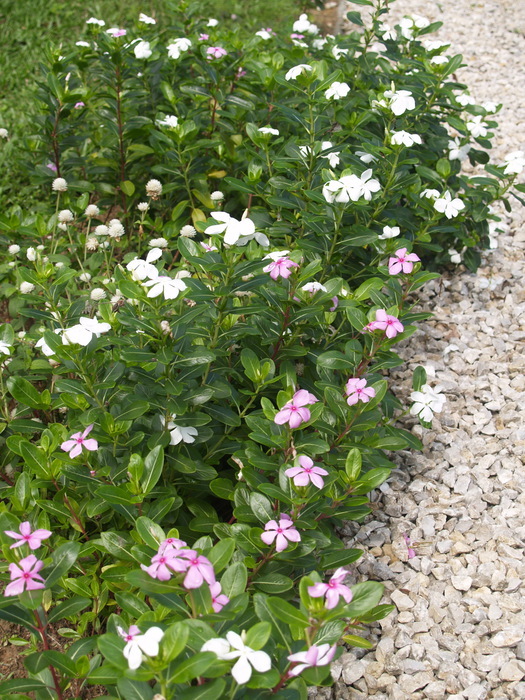 Catharanthus roseus Thai name แพงพวยฝรั่ง (phaeng phuai farang) Madagascar or rose periwinkle. 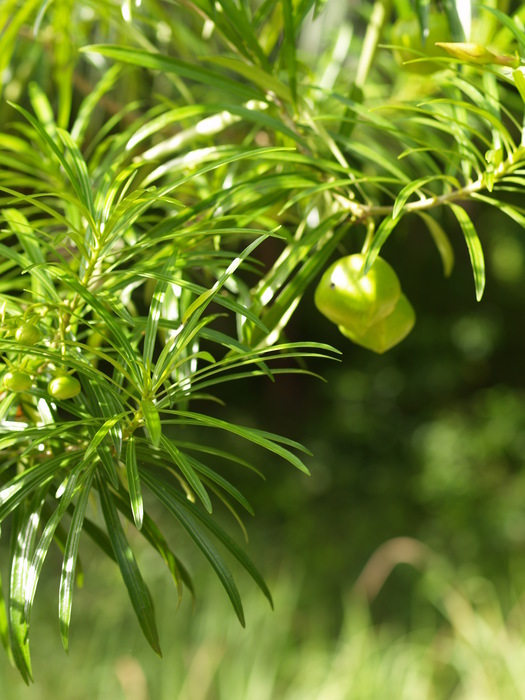 This plant from Madagascar was introduced in the tropics as an ornamental plant. 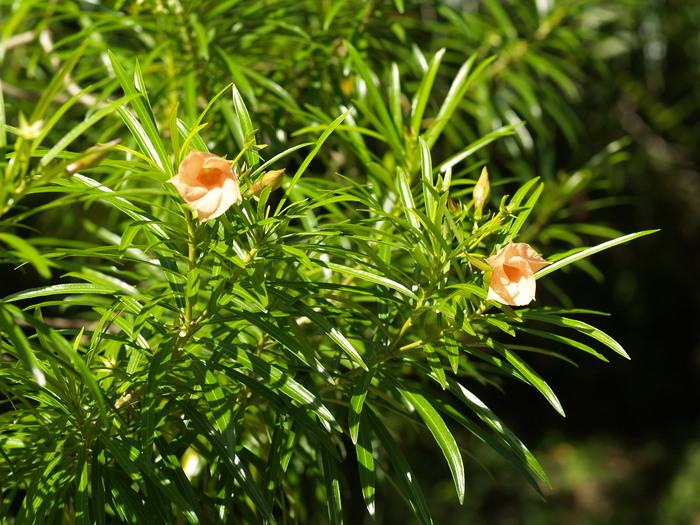 Traditional the plant is used to treat malaria, diarrhea and skin diseases. The tea was used for treatment of diabetes. There are about 100 alkaloids present in these plants, most are simple but also complex molecules, build of the simple ones. These complex compounds like vincristine or vinblastine are used to treat cancer. Vincristine for example is used (as injection) in chemotherapy in acute leukemia, Hodgkin’s disease and many other cancerous diseases. It needs more than 3 kg of the dried herb to make one injection with 1 mg vincristine. These alkaloids prevent the formation of microtubules in the metaphase of cell divisions. So the fast dividing cancer cells are slowned down or even killed, but this has severe side effects on normal cells also. Some of the simple alkaloids have a antidiabetic action. 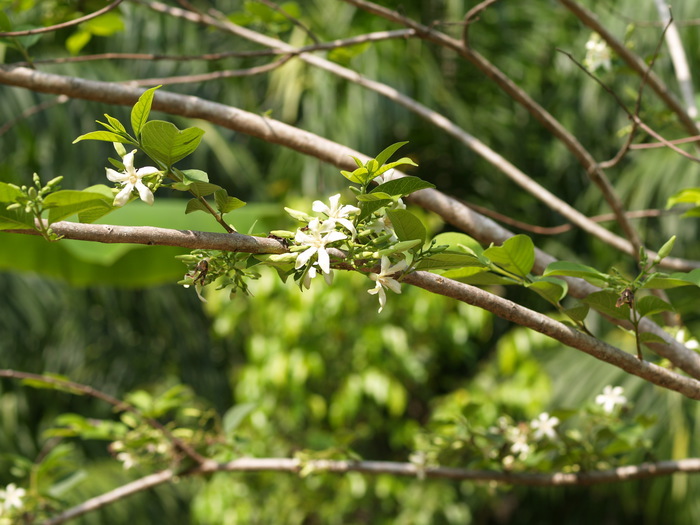 Holarrhena pubescens Thai name โมกใหญ่ (mook jai) Holarrhena (Eng) Ecorce de connesie This is the French trade name for the most used part of the plant: the bark. This tree has a wide distribution in the old tropics, including Thailand. The bark (and seeds) are used against amoebic dysentery and other protozoan diseases. The seed oil has anthelmintic properties. The active principle in the bark is the alkaloid connesine. Connesine is also highly toxic to Trichomonas intestinales and T. vaginalis. It can inhibit the grow of insect larva’s. 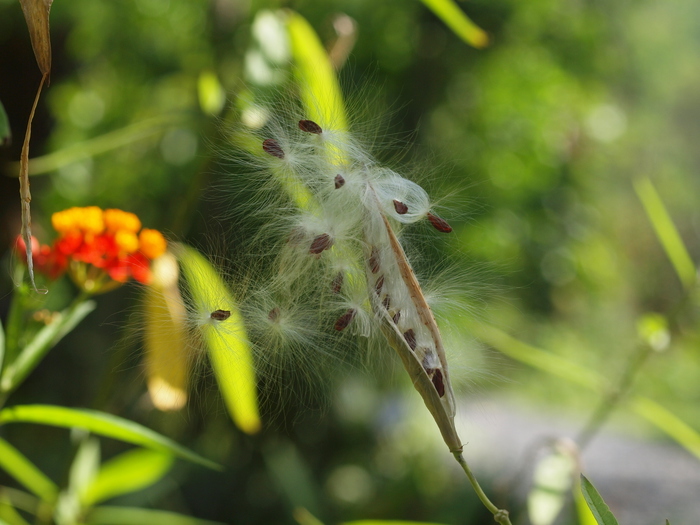 Seed extracts have antibiotic activity against for example Pseudomonas and Staphylococcus. 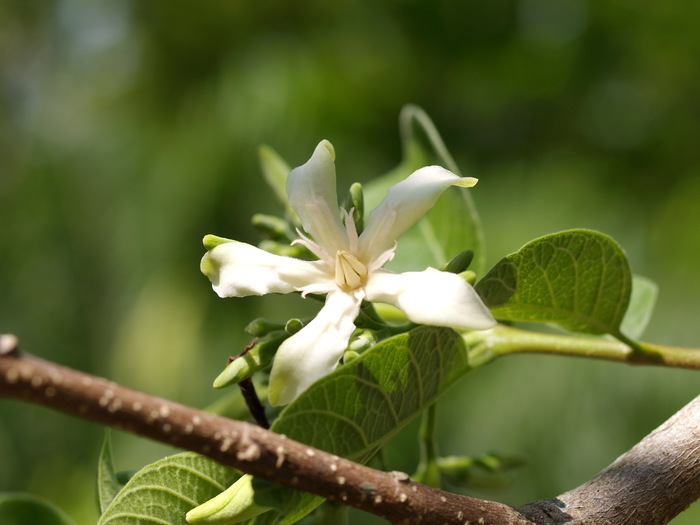 As an ayurvedic medicine in India it is used to cure snakebites, epilepsy and mental diseases like psychoses and epilepsy. Other uses are the uses are: dysentery, stimulating child birth and for uterine contractions. There are more than 50 alkaloids present, mostly indol alkaloids like reserpine, derived from tryptophane. This is the raw material for neurotransmitters that regulate basic functions like blood pressure and emotional feelings in the mind. After the introduction of reserpine in 1952 in Western medicine it changed the treatment reducing blood pressure completely. Reserpine has a strongly lowering blood pressure effect and at the same time anxiety releasing action. It has a depleting action on the neurotransmitter vesicles for a number of neurotransmitters. The drug in over dosage gives rise to severe depressions. The modern anti-depressives are supposed to prevent the fast removal of these neurotransmitters from the side of action. Thailand alone exported up to 100 t/year of the dried root powder. In 1982 the price of powdered roots was 9 US dollar for 1 kg, and reserpine about 2.5 US dollars per gram. 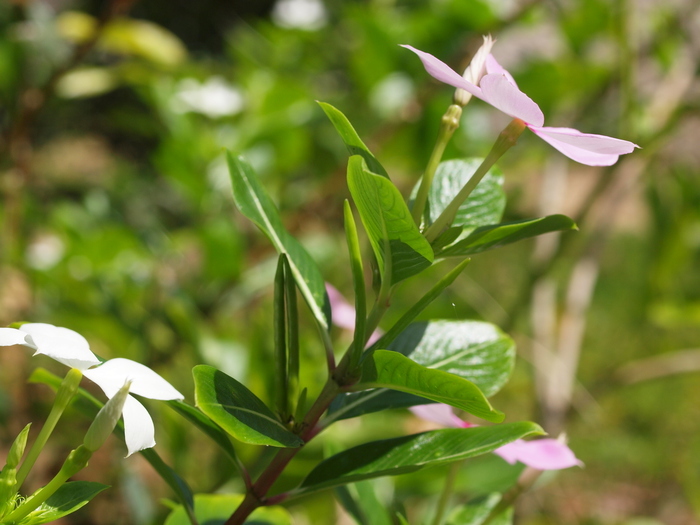 Now cell-cultures are used to produce basic indol alkaloids, and enzymes needed for processing the indol like chemicals, but not yet for the highly complex alkaloids in Catharanthus roseus. In the western world this plant is now scarcely used because of the difficulty to maintain a safe action of the single substances. Strophanthus gratus Thai name บานทน, แย้มปีนัง (baan thom, jaem pi nang) Climbing oleander. 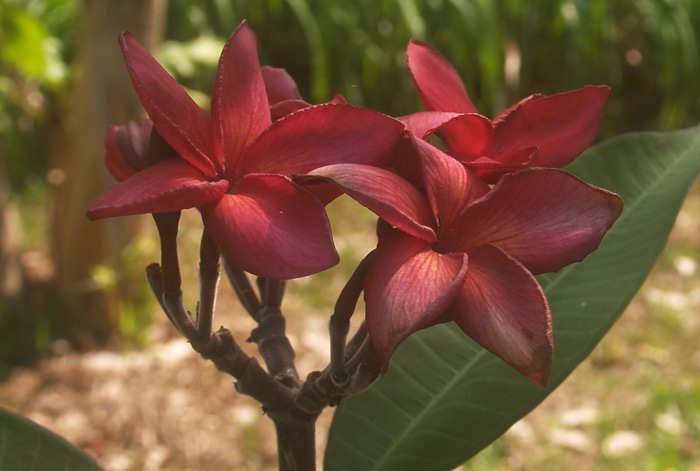 This is an very showy, good smelling ornamental African plant, also popular in Thailand, and not because of its interesting pharmaceutical properties. 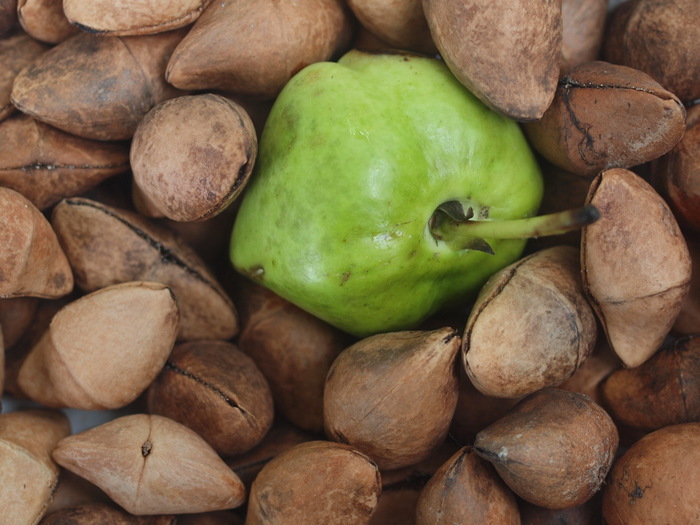 The milky juice and the seeds are traditionally used to prepare poisonous darts in Africa. Small quantities are sufficient, and work quickly. The seeds contain a mixture of cardiac-glycosides, with a mode of action like the well known digitalis cardiac-glycoside. The main glycoside is g-strophantin or ouabain. ( inhibition of K/Na-pump in the cardiac cells). Eating these plants or drinking tea can be very dangerous. You can get very ill, but the compounds induce vomiting. Most of the times this vomiting is enough to survive the consumption. Generally animals like caterpillars that are resistant for these toxic compounds in their food, can accumulate these compounds in their body. Predators will die or learn not to eat these toxic animals. Medicinally ouabain is only clinically used as an injection for emergencies in congestive heart failure. The action is faster and of shorter duration than cardiac-glycosides in the genus Digitalis. It is very easy to inject too much of the drug and together with its fast action it is than an effective poison (poison darts). 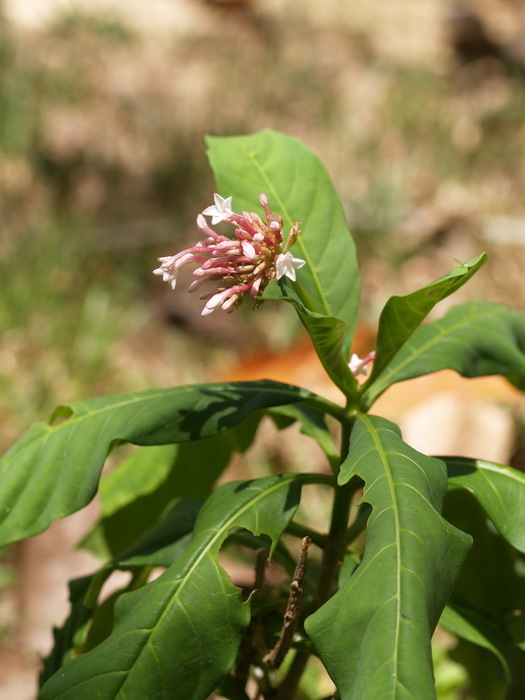 In folk medicine a watery extract is used for treating snake bite. 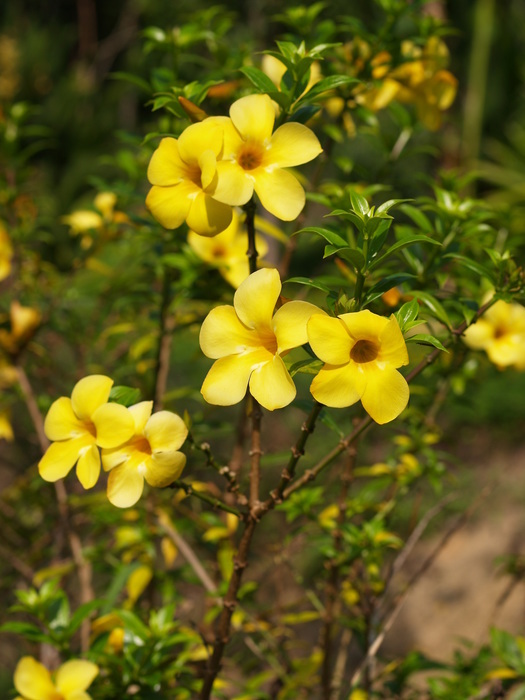 Allamanda cathartica Thai name บานบุรีเหลือง (baan buri luang) Allamanda, a yellow climber and very popular ornamental. Origin S. America. It can be used for its laxating and vomiting inducing action as the name 'cathartica' implies. Leaves are also used in wound healing. 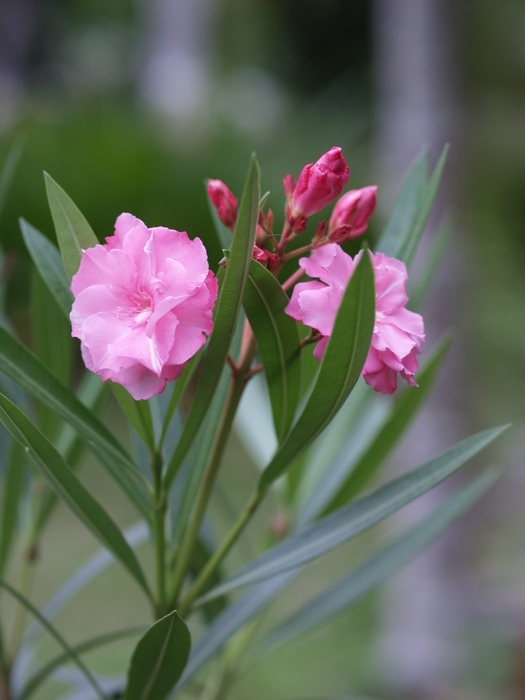 Thevetia peruviana Thai name กระบอก (kra bohk) Trumpet flower and the Nerium oleander Thai name ยี่โถ (ji pho)the Oleander. Both species contain cardiac-glycosides and thus dangerous ornamental plants. 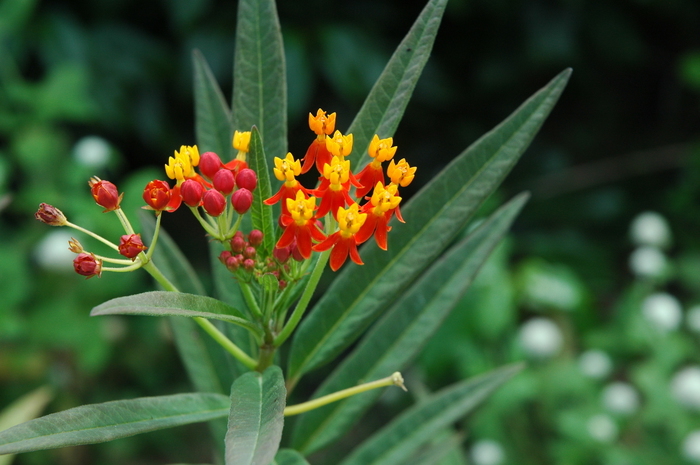 Asclepias curassavica Thai name ไฟเดือนห้า (fai duean ha) Blood flower, was in the Asclepiadaceae family, but this family is now included in the Apocynaceae. Contains also cardiac-glycosides. Plumeria sp. Thai name ลั่นทม (lan thom) frangipani, an ornamental tree, with scented flowers that are used in temples and in perfume production. It seems that these trees are not very toxically. 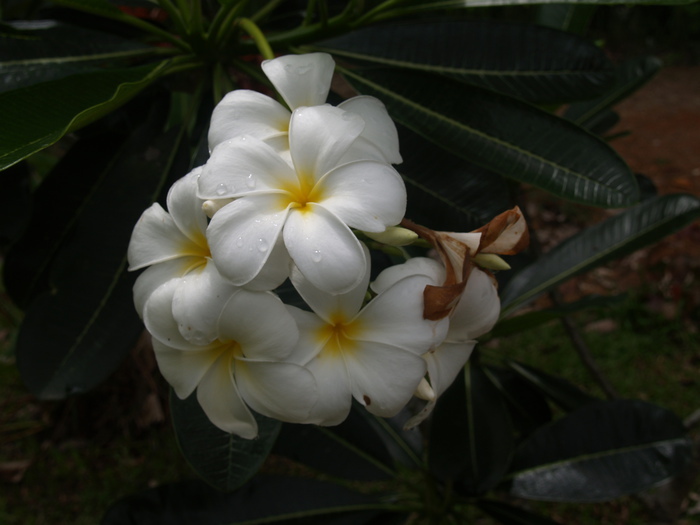 Plumeria is small genus with its origin in tropical America. Most information in this document is to find in Plant resources of South-East Asia Vol. 12(1). This link offers information about cardiac glycosides. Wikipedia is sometimes a nice place to refresh and enrich your knowledge about alkaloids. Strophanthus gratus Most information on cultivation and breading.